This is a 100% honest, 100% authentic Aurora HDR Pro version 1.2.2 photo editing software review. Dadtography received a complimentary download of the product, but we were not compensated in any way for this post. Some links below, marked as (af), may be affiliate links. Sales made resulting from clicks on affiliate links provide a small percentage of each sale to Dadtography.com. Admittedly, I was a bit skeptical when first approached by Macphun.com, the makers of the Aurora HDR photo editing software. Was Aurora HDR yet another image editor trying to steal market share from the "big boys" like Adobe's Photoshop and Lightroom products? Participating in the Samsung Imagelogger project introduced me to the Lightroom product. My satisfaction with Adobe Lightroom remains high. I've really gotten used to the features and layout. However, I've yet to make the jump to the Adobe Cloud where HDR editing is supported. When I was asked to check out the Aurora HDR product (af), I almost dismissed it without even taking a look. Well, I'm glad that I didn't do that, because the product surprised me a bit. It should be known that I'm not an advanced HDR photo editing user at this point. I know my way around my cameras and I can hold my own in Lightroom, but HDR is a pretty new concept to me. I've seen the amazing photos that it produces, and read some of the controversies surrounding the technique - namely the photos aren't "realistic". To me, though, photography is definitely an art form, and HDR editing is one way to express your vision in a unique way. I set out to see just how good the Aurora HDR software was, from a beginner's perspective. Modern user interface (UI) - I know this may sound a bit silly, but as a software professional, I really appreciate a good looking, functional application. This app looks like someone put some time and thought into the design of the application. Considering how many options there are in photo editing, I really like the look and feel of Aurora HDR. Familiar Layout (as compared to Lightroom) - Part necessity and part tradition, photo editing software largely have the same features and functions so their arrangement of those features doesn't often deviate too dramatically. Having worked with Adobe Lightroom for a few years now, I appreciate the familiarity Aurora HDR provides. Very handy filter presets - from a novice HDR editor's perspective, I really like the presets that come with Aurora. I usually learn through experimentation when editing photos, so the presets are a good way for me to "see what this does" and adjust my settings from there. Use as a Stand-alone app or Lightroom & Photoshop plugins - I've been using the app as a stand-alone program on my Mac, but you also have the ability to install either Lightroom or Photoshop plugins as well. Installing the plug-ins provides Aurora HDR editing functionality inside those applications. So if you don't even want to bother with using Aurora separately from your existing workflow, you don't have to! RAW camera file support - This feature may be considered a bit on the advanced side, but I like that Aurora supports native camera RAW files. RAW files contain all the original information from an image and are much easier to manipulate. You can still import JPG files for editing in Aurora, but I strongly recommend you work your way to using RAW files instead. 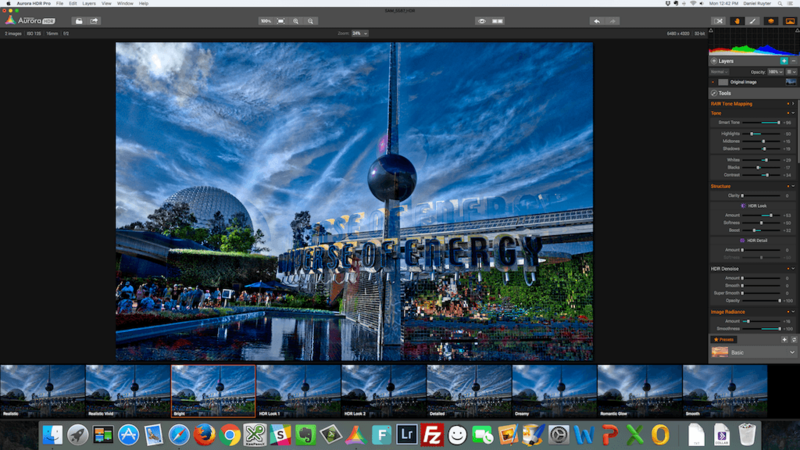 Overall, Aurora HDR is a great image editing software. Finding a good app to edit photos can be a real challenge. You have to balance ease of use with powerful features and that can be very difficult to do. That said, Aurora has its challenges. Here are the biggest ones I've noticed so far. Clearly, it's not the latest and greatest hardware so your experience may vary if your computer has a bit more power than mine. The performance of my external hard drive over the WiFi network may be part of the problem. The network performance may not be able to keep up in my case. The HDR photos I've edited so far have all been using DNG files as the source files. I'm pulling in between 3 and 7 DNG files to create the final HDR image. Each DNG file is around 30MB and it looks like the Aurora HDR saved files simply add all those source files together. I've had a few Aurora files that have been close to 1GB in size. There Just Aren't Enough Feature Differences Between "Standard" and "Pro"
Don't get me wrong, I think the features that are in the pro version of the app are well worth the cost. I think my complaint is that the standard version shouldn't even be offered without them. My favorite feature by far that's only in the pro version is the auto-ghosting reduction. Check out the examples below. One image is with ghosting reduction turned "on" and the other is with it turned "off". The above is an extreme example of the Ghosting reduction feature. Both photos were taken hand-held (not using a tripod) and aren't exact matches. What the ghosting removal feature tries to do is remove the differences between the photos automatically. Notice on the first image with "no ghosting", the "double vision" effect on the Universe of Energy sign. This is almost entirely removed by the ghosting reduction feature of Aurora HDR. What are the features found in Aurora HDR? The feature list was pulled from the Aurora HDR "Getting Started" tutorial website (af). For a full list of the differences between the Standard and Pro versions of Aurora, I wrote up this post with all the details. Is Aurora HDR easy to use? Ease of use is very important when it comes to a photo editing application for me. It took me a while to get used to editing photos in Adobe Lightroom, but as I did, the process became faster as well as more and more enjoyable. Many people that don't fully understand what photography is only see the aspect of taking the photos. They don't fully appreciate all of the effort that goes into the process after the photos have been taken. Starting from a perspective of having around 2-3 years of Adobe Lightroom experience, I was able to get started very quickly with the Aurora HDR editing process. That said, even if you don't have a ton of experience in photo editing programs like Lightroom or Photoshop, I think you'll pick up on Aurora pretty quickly. The user interface is very intuitive, and despite all the options, the application makes it easy to experiment with settings to see what you like and don't like. The Aurora HDR interface is very intuitive and makes it easy to experiment with photo settings. Q: Is Aurora HDR compatible with Windows? A: No, Aurora HDR is currently a Mac-only application. Macphun has indicated they intend to make a Windows-compatible version at some point. Q: Is there an update for 2017 coming from Macphun? A: Yes, Macphun has already announced the release of a Aurora HDR 2017 version of the application. Q: What does HDR mean? A: HDR stands for "high dynamic range". The process involves merging multiple versions of a scene into a single image to create a more vibrant edited photo. Q: Are there training resources available for Aurora HDR? A: Yes, Macphun produced a ton of educational content to get users started. Click here (af) to view these resources or download the official Aurora HDR guide (PDF). What do you think? Have you used Aurora HDR for photo editing? Leave your thoughts in the comments below!